The Miracle of Baking Soda: It’s pure. It’s simple. It’s extremely versatile. Due to unique chemical and physical properties, Baking Soda is a gentle cleaner, effective deodorizer and a leavening agent for baking. Is there another single product that can do so much? 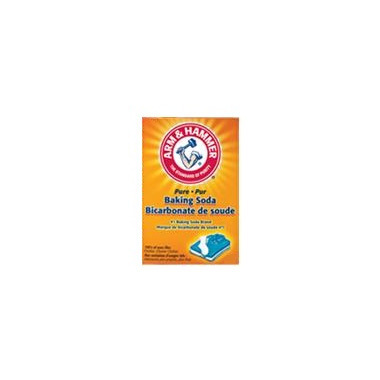 Arm & Hammer Baking Soda, a clean house in every box! I think it is a very useful natural product in personal and household cleanse. I put this baking soda in a mason jar with epsom salts. Shake to mix together and use in the bath. Also use this baking soda to clean area rugs. Shake on the rug, spray vinegar from a spray bottle. Let it sit in the area rug and then vacuum. Carpet is just like new again. Use this all the time for cleaning, laundry, bathing. Good for the environment and allergy sufferers. I use this to scrub the bathroom, it works well. I use it as toothpaste and I love it. I use it everyday. Couldn't live without it. Works well as toothpaste, shoe deodorizer, deodorant, stain remover, cleaning my hairbrush, etc. Love this product! It can be used with anything. Lately, I use it mixing with vinegar for clearing a drainage in the sink. Highly recommended. So what else is new? Baking soda is baking soda!! The one and only! I always keep lots on hand for cleaning and odor control in the fridge. I use this not only for baking, but I also put a box in the fridge to absorb those nasty odours. Works great! Brand name product being utilized as a deodorizer in the fridge. I love this product. Very useful for many different things.